Every June there is a week-long celebration in Navajo country called “Sheep is Life.” I’ve wanted to go for years. I love the concept: Sheep=Life. A close friend asked me once, “what IS it about sheep and you?” I stumbled about with inadequate words. Much like when someone asks you “just why DO you love him?” Can one explain with logic what comes from a soulful place? What I do know is that spending time with sheep is a conduit to the soul – at least for me. Last week I discovered something brilliant: a chair in the llama lodge. I believe that a burp from a sheep indicates the same type of trust. Huckleberry came so close to me that he was almost in my lap. I hugged his substantial frame, then scratched him behind the ears and down the neck, and talked to him for a long time. He stood stock still, doing the heavy sheep breathing thing and staring straight into my eyes as I kneaded his spine. I’ve found, just by the way, that sheep are inordinately fond of massages. 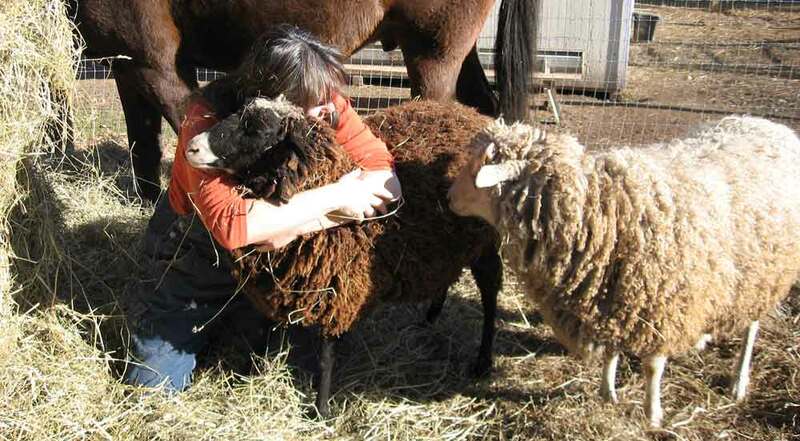 Huckleberry is a sturdily-built, strong-willed sheep, but he always makes my heart ache. He’s had hard times and has taken them hard; I’ve seen him change more significantly than any other animal on this farm. He came here 6 years ago with his brother Fred – they were less than 24 hours old. I remember helping the farmer hold down the mother, who refused to feed these babies, while we squeezed out the colostrum from her teats, so essential to lambs’ ability to build antibodies. Huckleberry – a perfect white lamb whose mother didn’t want him. What a hell of a way to start out life. He and Fred lived initially on my back porch, and, twice a week when I had to go to my office, spent the day with the neighbors whose elderly mother was slowly dying. They gave the lambs their bottles and watched their young frolicking. Always the force of life and the pull of death was upon these lambs. They travelled in the truck often – to schools for educational presentations, festivals for farm outreach, fundraisers. We even got a speeding ticket together, once. They walked on leashes and loved to meet new people. Fred was the outgoing guy; we dubbed him “Outreach coordinator”. Huckleberry was sweet and shy. They were never apart. They tormented me for nearly a year by hiding behind my car as I was going out the gate, and then rushing out in front of me, resulting in a (to me) very annoying game of hide and seek. Those days I was late to pretty much everything. Huckleberry was the cute guy who always stood behind Fred. He didn’t seek out interactions with people – just with Fred. Yet when the herd leader WC dropped dead very suddenly one day, and the sheep were gathered around in a circle, about 30 feet away, Huckleberry went directly up to the body, inclined his head down towards WC’s face, and stayed there for quite some time. Curious. Those were also the hospital days. Oh, it was a bad, bad year. Fred and Huckleberry both in intensive care for weeks after a bad bout with horse cookies, and then Fred in and out of surgeries while we tried to find a solution to his chronic urinary blockage. And the death of the matriarch dog Sage. So many issues, so many tears … after Fred’s death it took me some time to notice that Huckleberry had left the flock. He had simply divorced himself from all social interactions. He grazed alone and slept alone, and appeared angry at any attempts to bring him in. I’ve seen animals grieve soul mates before. George the duck almost died of sadness when his partner Betty was killed (and Harry the duck died defending his girl Tati from a fox). When Miss Lucy the horse passed away, Dee Dee Donkey circled the house braying on and off for weeks. Andy the rabbit ended up in the hospital after his girl Star died. Powerful bonds broken. Fred and Huckleberry used to dance up and down the driveway together. They ate together, slept together, played and butted heads together. They were insanely happy, two peas in a pod. So what was life for Huck without Fred? No, he simply checked out. It took more than 6 months for him to come around to being a sheep again, and when he did, he arrived transformed. He was not the calm, angel-faced leader that WC had been, nor was he any longer the shy and retiring “don’t mind me, I’m just a sheep” guy he had been before; he had a mission, and that was to fiercely defend his flock. He stands (and looks a bit) like a linebacker when newcomers arrive at the farm. He stares them down, and head-butts them – hard – if they go too close to any of the other sheep. He has both livestock guardian dogs cowed, and I even saw him whack Jean Claude the llama the other day – no one messes with him. But then, Huckleberry has nothing to lose. As a leader, he is still a lonely sheep. It touches me in a way I find difficult to define that Huckleberry has of late chosen to spend time with me. As we’ve sat together, I’ve noticed possibly for the first time his straight, fine, pure white eyelashes; his pale, pale lage green eyes with enlarged pupils as though he’s been taking belladonna; the fine shape of his straight Roman nose. Though his body is somewhat misshapen due to his previous illness, his tail looks crooked, and he always seems to attract stray bits of dust and straw to him, his heart is open. He pulls no punches – he is all there. So now, I lean on him and he leans on me. I don’t know if we are allotted more than one soul mate each in this life. What I do know is that a generosity of spirit is required in order to know that you had one in the first place.